(((NCHAM serves as the National Technical Resource Center for the implementation and improvement of comprehensive and effective Early Hearing Detection and Intervention (EHDI) systems. As a multidisciplinary Center, our goal is to ensure that all infants and toddlers with hearing loss are identified as early as possible and provided with timely and appropriate audiological, educational, and medical intervention. Materials and activities described on this website were funded in part by a cooperative agreement (U52MC04391) from the Maternal and Child Health Bureau (MCHB) of the Health Resources and Services Administration (HRSA) at the United States Department of Health and Human Services. NCHAM staff are responsible for the views and content of material on this website and no endorsement by MCHB/HRSA is implied or expressed. Would you like to learn American Sign Language (ASL)? If you have a child who is deaf or hard of hearing who is under 36 months of age, click here to get free access to an innovative on-line curriculum to learn ASL. An interactive resource, in English and Spanish, for parents and professionals to support spoken language development. NCHAM is a research center at Utah State University and is supported in part by funds from the Utah State Legislature as well as various private, state, and federal entities. Since 2001 NCHAM has also served as the National Technical Resource Center (NTRC) for all state-based Early Hearing Detection and Intervention (EHDI) programs in the United States. The work of the NTRC is funded in part by a cooperative agreement (U52MC04391) from the Maternal and Child Health Bureau (MCHB) of the Health Resources and Services Administration (HRSA) at the United States Department of Health and Human Services. Materials and activities described on this website represent many different views and opinions by stakeholders interested in improving services and outcomes for children who are deaf or hard of hearing. Authors and developers of those materials and activities are responsible for the views and content of material on this website and no endorsement by NCHAM or MCHB/HRSA is implied or expressed. Disclaimer: The information provided in the newsfeed is intended to be general summary information to the public based on material found in various media. NCHAM seeks to promote dialogue about issues related to hearing loss in children including research findings, legislation, treatment & diagnosis, etc. and does not necessarily endorse the information contained in the material posted in the social media platforms found on this website. Any views or opinions presented remain the responsibility of the originating media source. The 2019 EHDI eBook is Now Available! 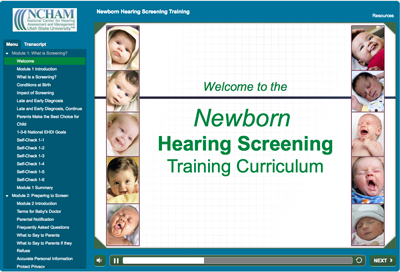 The Interactive Newborn Hearing Screening Training Curriculum (NHSTC) is now available! The Building your Skills in Nonprofit and Conflict Management webinar recording is now available! The Preparing to Teach, Committing to Learn: An Introduction to Educating Children Who Are Deaf/ Hard of Hearing eBook is Now Available! Have a question about EHDI programs? Please contact the NCHAM Helpdesk at 435.797.3584 or visit our support and contacts page.